With a summer full of research and exploration under our belts, the Museum of Walking is excited to enter the Fall 2015 season with new treads. To kick-off the season, Museum of Walking is partnering with Phoenix New Times, Scottsdale Public Art, and Arizona-based writers to present a special edition of the new hit literary series Bar Flies. The storytellers will be reading about a prescribed walk they were asked to take in downtown Phoenix in the middle of an Arizona summer. Then, the sweaty and crumpled scripts from the Bar Flies: Take a Walk event at Crescent Ballroom will be hung in an upcoming exhibition, Talking Walking, opening on October 6th, 2015 at the MoW location in Tempe. If you missed the Radius exhibition there is still time to catch it before it closes. Your last chance will be Wednesday September 30th, 2015 - the day of Bar Flies: Take a Walk, so you can have a full day of MoW fun! Stop by MoW in Tempe before strapping on your walking shoes for the evening event. Gallery hours for the Museum of Walking are every Wednesday from 2pm-6pm for Fall 2015. Our new intern, Kyle Daniels, an Intermedia undergraduate student at Arizona State University, will be around the museum during regular hours on Wednesday afternoons. So, stop by to meet him and he can introduce you to the recently updated Museum of Walking Research Institute (MoWRI). On October 10, 2015 MoW will gather in Douglas, AZ to walk Postcommodity's Repellent Fence installation. As fans of this work we are inspired to experience this land-based artwork and socially engaged project. MoW is also looking forward to other public events planned for October 9-12, in conjunction with Postcommodity's installation. MoW is participating in two regional conferences this Fall with talks and walks led by Angela Ellsworth, Adriene Jenik and Heather Lineberry. Adriene and Heather will conduct an interactive presentation, Desiring Lines: Women Walking As Making, as part of the tenth biennial Feminisms and Rhetorics Conference at ASU this October. With women and walking as the focus we will engage another walk for the 25th International Sculpture Conference in November led by Angela, Adriene, and Heather. In addition to the walking tour for the ISC, Angela will speak as part of a panel discussion entitled Outwardly Mobile: Wanderlust and Physical Mobility in Contemporary Sculptural Practice, where the itinerant foundation of the Museum of Walking will be discussed. Silent Walks this year will be organized by Curators of Walking and local artists, Laurie Lundquist and Angela Ellsworth. Join them at various times throughout the year to explore our desert surroundings and participate in these unique experiences. More details can be found below or on our website. The Phoenix New Times literary series Bar Flies is on the move for a special Best of Phoenix event presented in collaboration with the Museum of Walking and Scottsdale Public Art. The Museum of Walking, along with Scottsdale Public Art, invites you to observe a section of our urban landscape as you take a guided group walk from Valley Bar to Crescent Ballroom. Upon arriving at Crescent, you will be invited to post a map of your own walk before listening to the night’s featured writers read works inspired by their walks of the same route. Click here for more event details, directions and tickets. 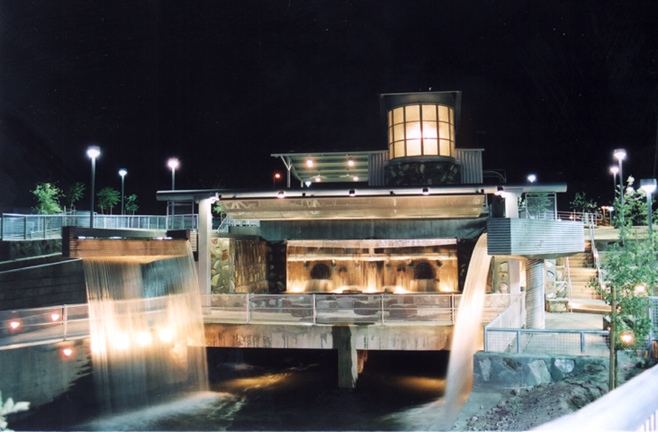 We will meet at Arizona Falls by 8pm, there is free on-site parking until 10pm, and then together we will mindfully meander along the Arizona Canal Trail in silence to Soleri Bridge and Plaza at the cross-section of Scottsdale and Camelback Roads. For more details click here. The Museum of Walking is a huge fan of Postcommodity's and as such we are planning to attend their public events that are taking place in conjunction with the Repellent Fence installation October 9-12, 2015. As supporters of this work MoW will gather on Saturday, October 10 to walk portions of the Repellent Fence, as well as up D (Douglas) Mountain, to experience this socially engaged work. 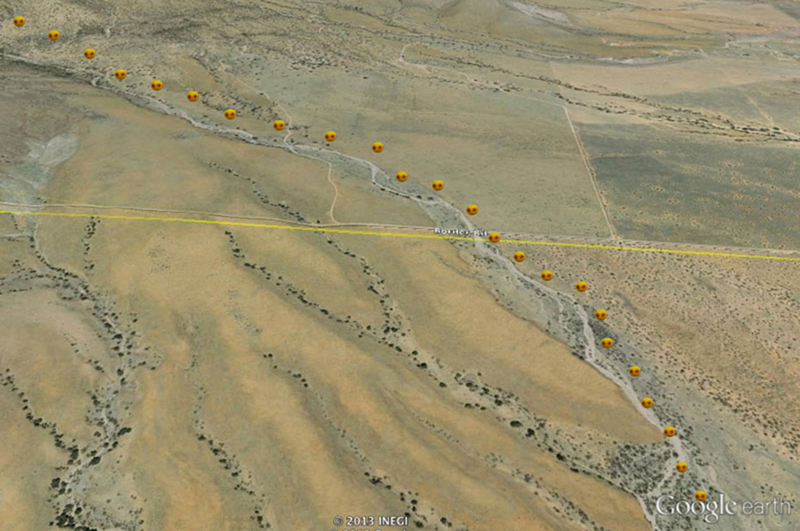 From D Mountain we will have a view of the long line of balloons that intersect the border. Those interested in joining this walk should RSVP in advance in order to receive additional information and updates. A collaborative interactive presentation by Adriene Jenik and Heather Lineberry, created in association with Angela Ellsworth. As part of the Tenth Biennial Feminisms and Rhetorics Conference, Adriene Jenik and Heather Lineberry will invite conference participants to walk with them in a unique interactive experience. Adriene and Heather, will lead participants on a silent intentional walking procession through a thoughtfully chartered accessible route from the conference location through the Diane and Bruce Halle Skyspace Garden (designed by landscape architect Christy Ten Eyck) to Air Apparent the contemplative, intimate architectural environment created by public artist James Turrell, located on the north-west corner of the ASU Tempe Campus. Upon arrival the collective silence will be broken in order to share observations of this silent group walk, read reflections on walking, and share information about women artists who have used walking as a means to create political, poetic, and environmental works. For more general information on this discussion and details of the wider Feminisms and Rhetorics Conference, of which this panel is associated, click here. A panel discussion with Angela Ellsworth, Steve Rossi and Richard Saxton. Moderated by Emily Puthoff. Bringing together artists who each incorporate aspects of wanderlust and physical mobility in their creative process, this panel will discuss the specific strategies and experiences of artists who situate their works in a nomadic context as part of the exploration of New Frontiers in Sculpture for the 25th International Sculpture Conference being held in Phoenix November 4-7, 2015. Reacting against the historically permanent and monumental nature of sculpture, many artists are incorporating mobility into their practice as a way to actively engage a variety of populations. This physical mobility allows the artists to transgress economic and cultural barriers to forge new networks and insights along the way. For more information on this panel discussion and full artist biography's click here. Outwardly Mobile: Wanderlust and Physical Mobility in Contemporary Sculptural Practice is one component of the larger 25th International Sculpture Conference: New Frontiers in Sculpture being held from Wednesday November 4 to Saturday November 7 in Phoenix, Arizona. For more general information on the conference, a guide to travel and accommodation, full schedule of events and registration details click here. A participatory walking tour with Angela Ellsworth, Adriene Jenik and Heather Lineberry. Join local artists Angela Ellsworth, Adriene Jenik and Heather Lineberry on a contemplative walk from the Museum of Walking to artist Jody Pinto’s Papago Park City Boundary Project. Upon arrival, share observations of the group walk and information about women artists who have used walking as a means to create political, poetic, and environmental works. All conference participants are invited to join this activity. A light snack and a bottle of water will be provided. A wide-brimmed hat, durable walking shoes, sunscreen, and additional bottled water are recommended. Desire Lines: Women Walking as Making is one component of the larger 25th International Sculpture Conference: New Frontiers in Sculpture being held from Wednesday November 4 to Saturday November 7 in Phoenix, Arizona. For more general information on the conference, a guide to travel and accommodation, full schedule of events and registration details click here. We are excited to announce that local artist, Laurie Lundquist, will be joining the Museum of Walking as a Curator of Walking. Throughout the year Laurie will create and lead walks of varying lengths and challenge, exploring the desert landscape and indulging our desire for complete freedom, that can only be found when in nature. The location, duration and intensity of this walk are to be determined. For updates click here or RSVP in order to receive additional information. At the end of the Bar Flies: Take a Walk event, the readers stories will be collected in all their original glory in order to become part of the new exhibition at the Museum of Walking in Tempe. Whether covered in sweat, beer or scribbles the scripts will be gifted to MoW exactly as the writers have them in the final moments of the storytelling event. The scripts will then be exhibited on the walls of MoW while the sounds of the walks being described fill the space around you. Bar Flies Readers include: Becky Bartkowski, Rebecca Fish Ewan, Brandon Ferderer, Tania Katan, Laurie Notaro and Sativa Peterson. The last chance to see Radius 1 will be Wednesday September 30, 2015 during regular museum hours 2pm-6pm.